Twist, swirl and bind your way to total tie-dye creativity with Tulip® Rubber Bands! 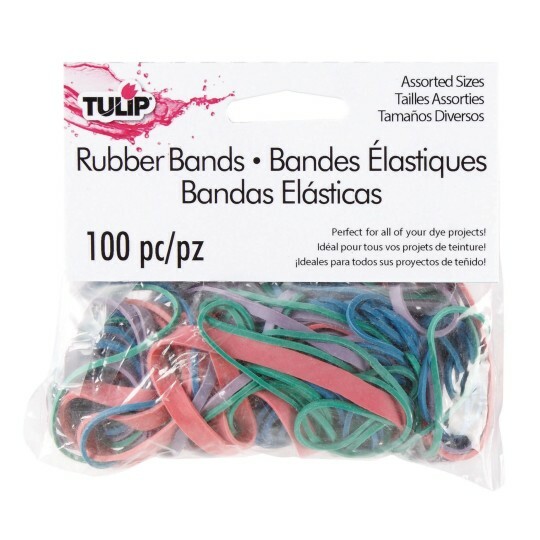 This top-quality bulk pack includes 100 assorted colored bands in 4 different sizes for a variety of thicknesses. A wider band provides more resistance for cleaner breaks between colors. Rubber bands can be easily cut from fabric once the dye process is done. Pack of 100. Colors will vary. I use these bands to group leveled books together. The good thing is the band does not break! !